The MkVII VW Golf GTI is a car that is revered by pretty much every motoring hack out there. Yes, there are sharper and more exciting hot hatches, but for a fast, capable and entertaining car that’s able to tick almost every box going, it’s hard to beat. And when it’s sprinkled with a little extra spice, you end up with something incredible like the Clubsport S, or something less incredible but still loveable like the new GTI TCR. It hasn’t always been this way, however. The Golf GTI’s back-catalogue is patchy, and it’s always seemed to be the MkIV that’s been on the receiving end of the flack. Its detractors claim its bulbous body is an unacceptably huge departure from the beloved MkI and MkII, that it’s too heavy, and that it’s too slow. And I’m sure we can all agree the 2.0-litre N/A eight-valve with its paltry 113bhp output simply didn’t deserve to be badged as a GTI. In fact, in many markets, it wasn’t, but the fact VW had the affront to label it thus in some quarters is another black mark against the maligned fourth-gen. Even Bernd Pischetsrieder - VW’s chairman during the early 2000s - wasn’t a fan. Around the time of its discontinuation, he described it as “too slow, too average”. He concluded: “It was not a proper GTI. It was a good example of marketing getting it wrong”. Ouch. When slipping behind the wheel of one for the first time at the recent GTI TCR launch, my expectations were low. The cabin certainly doesn’t do anything to dispel the notion that this is the ‘lost’ GTI generation - the only thing breaking up this joyless space is the golf ball-like gear knob. However, this particular GTI - one of VW’s own heritage cars - is not the naff 2.0-litre. It’s not the 125bhp naturally-aspirated version of the unusual five-valves-per-cylinder inline-four either, nor is it the 150bhp turbo. 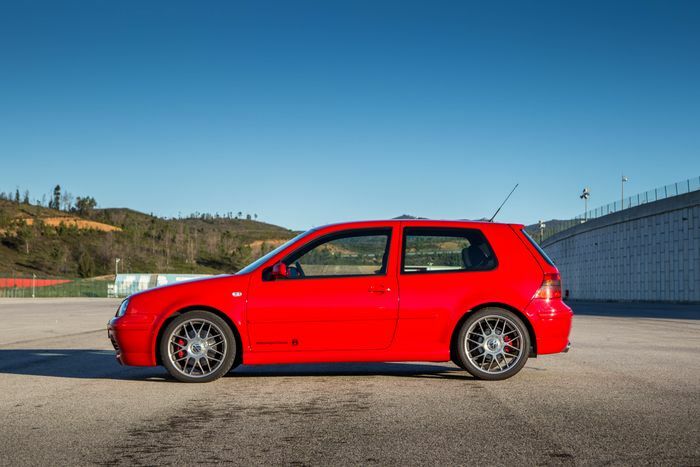 This one is the full fat 180bhp 20-valve turbo lump fitted to post-2002 cars, and it makes the MkIV GTI as fast - if not a smidge faster - than the MkV which replaced it. In fact, it still feels quick after jumping out of the 286bhp TCR. It’s not massively boosty for a turbo engine, and is nicely revvy, emitting a pleasant, reasonably brawny noise at high RPM. The gear change is so-so, but the manual shift hasn’t been a stand-out feature in any GTI, I’d argue. The front end may give up and push into understeer much earlier than a modern hot hatch, and there is quite a bit of body roll to contend with, but this is still a capable and fun car to drive. It’s certainly not the clumsy fatty I’d been led to believe it is. Understand the traction limits, adjust your driving as necessary, and you’re going to have a good time. You might even make it tripod occasionally. To cap it all off, I think the MkIV as a design has aged beautifully. The low bonnet, the unfussy, rounded proportions, those neat headlamps - who cares if it’s not boxy like the MkI and MkII? Admittedly, it does help that this is a 25th Anniversary Edition GTI. 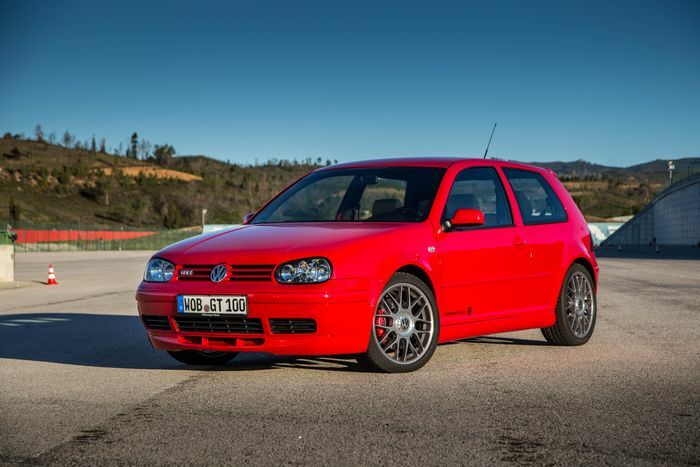 These were visually enhanced with a more aggressive bodykit and 18-inch BBS wheels, and the results of the aesthetic tweaks are extremely easy on the eye. The 25th is definitely the one to buy, or failing that, a regular 178bhp 2002-on car. But that’s the problem: taking a look at the cars available on the UK used car market right now, buying the right kind of MkIV GTI is going to set you back nearly as much as a MkV. Make no mistake, while the MkIV is - in the right spec - better than it’s given credit for, the MkV is the better car and one that’s worth stretching your budget for. It has a more eager, better-sounding engine, the front end is superior, and most importantly, you can have it with ‘tartan’ Clark Plaid seats. 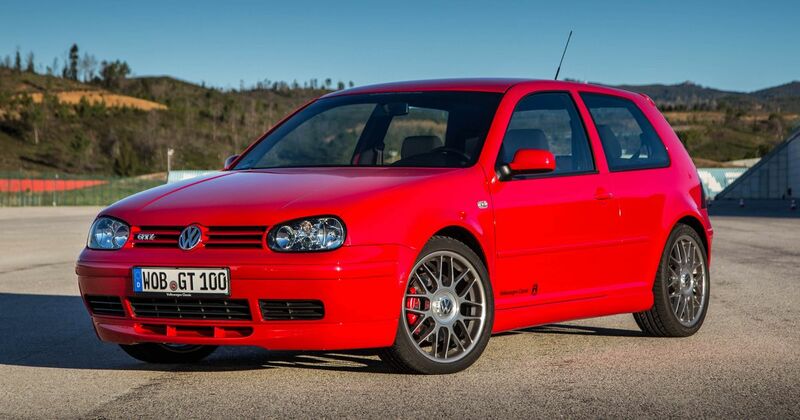 This is rightfully considered to be the car that got the GTI back on track, and it’s the one I’d recommend. I just don’t think the car that came before it deserves quite such a hard time.